Boost your home's curb appeal with a lick of fresh color on your front door. To inspire you to pick up a paintbrush here are our favorite hues for making any main entrance more inviting. 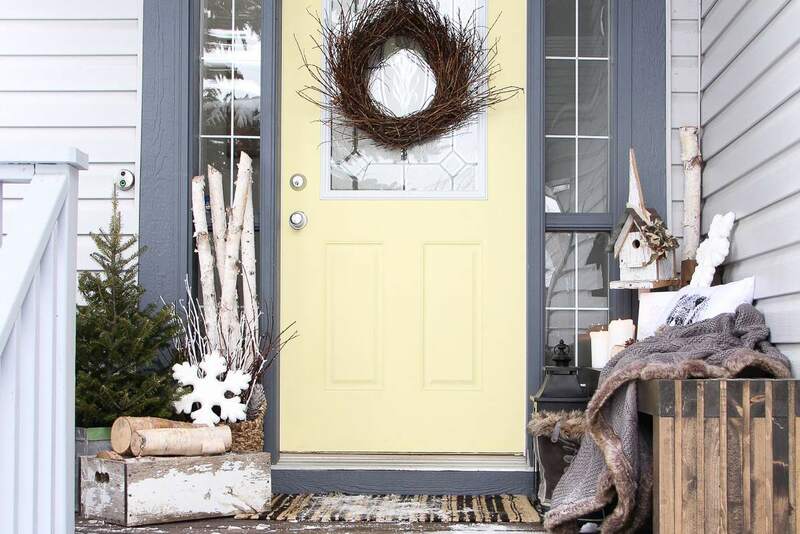 Jo-Anna Rooney, the home décor blogger behind A Pretty Life in the Suburbs, painted her front door a soft shade of yellow when decorating her porch for winter. The splash of warm color stands out like a ray of sunshine against a mix of woodsy seasonal accents. To get the look, we suggest using Light Yellow by Benjamin Moore. This houseboat aptly named the Floating House makes a dramatic statement with a bright, tomato red front door. 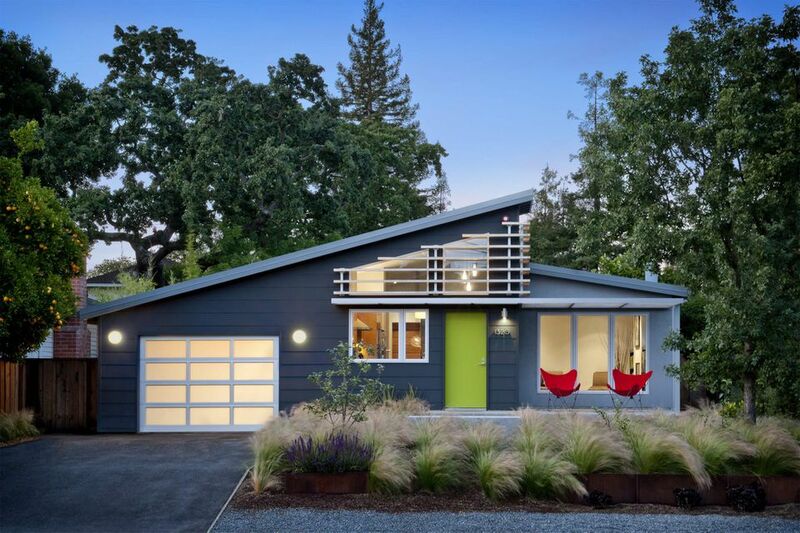 Enhancing the vibrancy of the bold color choice, is the home's robin's egg blue exterior. Love the look of this door? Reach for a gallon of Tomato Red exterior paint by Benjamin Moore. We love this charming home by California based interior designer, Carly Waters. The front entrance has a dark blue shiplap door with sleek, retro-modern house numbers. Potted cactuses placed on the stoop lends welcoming greenery. To duplicate this door's color try Loyal Blue by Sherwin Williams. Classic, and elegant, if you appreciate transitional style, you cannot go wrong with a black front door as shown on this house decorated by Ryan Saghian Interior Design out of Beverly Hills, California. The geometric patterned concrete floor adds a fresh, modern spin to what would otherwise be a traditional entrance. One of our top black paint picks for your front door is Jet Black Flat by Behr. Continue to 5 of 17 below. You may be surprised to learn that sage green is one of the top interior design colors on Pinterest — for real! This white beach house, by Urban Grace Interiors situated in Santa Rosa Beach, Florida features a front door in the soothing shade. Cobalt blue is a bold color that works for a broad range of décor styles. Here a beach bungalow by Chango and Company out of New York City has a front door in the splashy hue. A lively paint shade that will work for your entrance is Pitch Blue by Farrow and Ball. Here a farmhouse inspired front door painted a lovely hue of blue makes an inviting first impression in this charming cottage by Hendricks Churchill an architecture and interior design firm based in Sharon, Connecticut. A similar shade of blue you may want to try is New World by Dutch Boy Paints. Nothing says welcome home like a burst of sunshiny color as shown on this front door in a small house constructed by The Cottage Building Company out of North Carolina. The striking shade takes the serious edge off the dark gray exterior. A cheerful paint color 100 percent worth trying on your front entrance is Sunshine by Benjamin Moore. Continue to 9 of 17 below. Striking front doors in watery shades are not just for beach bungalows. This lovely for instance in a home by Kate Lester Interiors out of Hermosa Beach, California, captures that summery feeling all year round with an entrance painted a soothing shade of aqua. To give your curb appeal a dash of beach style try Aquaverde by Sherwin Williams. Dutch doors come divided into two parts; top and bottom, that open and close separately. The one shown on this modern farmhouse inspired home by California based firm Kelly Nutt Interior Design is painted a neutral shade called greige. The best paint to use to duplicate the looks is Gris by Sherman Williams. The hue is a bit more gray than brown. Wood Stain or Wood Paint? Perhaps you may want to skip the paint. Here a gorgeous Craftsman style wood, front door works for this home by interior design company, Black Band Design situated in Costa Mesa, California. If bold, look at me paint colors are not your thing, behold the front door on this lovely, brick house by Sarah Berry Design based in the U.K.
A breathtaking color that will take your front door to the next level as shown is Windy Sky by Benjamin Moore. Continue to 13 of 17 below. While olive green may not be your first choice for a front door paint color, for this white house by Rehkamp Larson Architects based in Minneapolis, Minnesota, the shade beautifully works. Two more features add to this front porch's welcoming appeal. The Moravian star pendant is a lovely decorative accent one would expect to see indoors. The bench style swing would make any adult feel like a kid again. An elegant dark green paint that is mighty similar is Olive Green by Glidden. Here a white front door is the finishing exterior touch on this crisp, white beach house by New York based interior design firm, Chango and Company. One of our favorite white paint colors is Decorator's White by Benjamin Moore. We got to admit that one of our favorite colors ever is turquoise. Here the popular hue adorns the front door of the house of the blogger behind Sunflowers With Smiles. When it comes to finding the perfect version of the color, we think you cannot go wrong with Turquoise Tint by Vaspar. Interior designer, Dale Minske, based in Connecticut, is not afraid to make unusual color choices. When working on this home, she selected a deep and wonderfully luxurious shade of purple for this front door. A regal hue that will hit it out of the park is a paint shade called Pelt by Farrow and Ball. Continue to 17 of 17 below. Ana Williamson Architect, out of San Francisco, California, built this contemporary ranch house, which has a distinctive retro modern vibe. The apple green front door is undoubtedly smile-inducing. To get your paint fix, try Apple Green by Benjamin Moore. How Does Door Construction Affect Soundproofing? Can You Replace an Interior Door With an Exterior Door? Solid Steel Doors: Are they Right For Your Home? What Are the Important Features of a Hollow Core Door?